Garden Patio Pros & Cons: Is It Right For You? If you’re trying to create a gorgeous outdoor space in your garden, then you’ll consider all sorts of options to achieve the desired look. Amongst the many ideas out there is a garden patio. You’ve all seen them before, perhaps a friend or family member has one in their garden, and it makes you a little bit jealous! It’s one of those things that I think everyone has in the back of their mind when they look to improve their garden. However, installing a garden patio is a pretty big decision, so you need to make your choice wisely. Sure, you may have seen someone’s patio and been blown away by the beauty of it. But, that doesn’t guarantee you’ll get the same result in your garden. Realistically, if you want to make the most informed decision possible, then you need to weigh up the pros and cons of a garden patio. By doing this, you’ll have everything you need to figure out the right decision for your garden. You can probably already guess that there are plenty of advantages to owning a garden patio. So, to start this guide off, we’ll take a look at some of the main ones so you can see what benefits you gain from having one. Arguably the main purpose of a garden patio is that it gives you an outdoor living area. A lot of people install patios right outside their house, with a patio door leading inside for easy access. The hard surface of a patio makes it easy to put furniture on, like tables and chairs – or even a hammock. This now means you have a stunning little area to eat dinner during the summer, entertain guests, or just sit outside and read a book. Not only does it add some aesthetic appeal to your garden, but it also improves the practicality of the space too. As a result, you get more out of your garden. Most people like the idea of a garden patio because of the sheer style it adds to your home. You can find a range of patio services like the ones at Allen Outdoor that let you create as elaborate a patio as possible. You can play around with the paving stones to make patterns that complement your house and garden. I’ve seen many gardens brought to life by a stunning patio, thanks to the fantastic style it adds. While I’m not looking to get into the classic patio vs. decking debate, this is one of the key reasons a lot of people side with patio; it gives you more creative freedom than decking. What’s more, you can almost match the patio paving to the exterior of your home for a seamless transition into your garden. If you d it right, it can look like your house is almost melting into your backyard! Granted, thinking about the value of your property might not be one of your primary concerns. Especially if you’ve literally just moved home and are looking at how you can improve the place. However, it’s well worth mentioning that a garden patio can increase the value of your home. Like I said, this might not mean much to you now, but someday it could be significant. Generally speaking, you should always be thinking about the market value of your house, just to ensure you don’t lose money when the time comes to sell it. So, this may not be a massive advantage to a lot of people, but it’s still worth including! For more great tips on adding value to your home, check out these 31 suggestions by Property Workshop. Another benefit of having a patio is that it lets you accommodate more accessories in your garden. A patio is a perfect place to have a firepit or a cute little fountain – or maybe even a small pond? You can also get patio lighting that just adds to the overall ambiance of your garden at night time. By bringing more accessories into your garden, you can improve the way it looks and functions even more than before. Probably the central drawback of patios is that they can be pretty expensive to install. Now, while you should definitely think of it as an investment (seeing as it adds value to your home), this could put some people off. Especially if you’re saving for something else, or just don’t have the money to spend right now. Installation prices obviously differ depending on the company you use, the materials you choose, and how big the patio is. But, in general, there are cheaper options like decking. Furthermore, think about all the extras you put on a patio too. We’re talking about garden furniture, lighting, and any other accessories you want. These things aren’t free, which just adds to the costs of having a patio. Another possible downside is that patio is hard to remove. So, if you change your mind after a month or two, it will be tricky to get the paving removed and return your garden back to its natural state. For this reason, you really need to make sure that you’re 100% set on getting a patio. If there’s even part of you that worries it looks terrible, then you should probably not get it until you’re up to that 100% certainty. For a lot of people, the prospect of having a patio means sacrificing some greenery in their garden. Now, this might not be an issue for some people as they could have a beautiful big garden full of greenery. So, a patio still leaves them with enough space for a lush green lawn. However, if you have a small garden area, then a patio could take up the majority of the room. In fact, some people with really small gardens need to choose between having grass or just having a patio out the back. It can be a tough decision as a green lawn really makes a garden look lovely. No matter how pretty a patio is, you almost need some nicely cut grass alongside it to complement the design. There are few things as satisfying as seeing your lawn all fresh and glowing. So, maybe this is something to think about if you’re considering getting a patio. Will it take up too much space and mean you have to sacrifice your lawn? If so, it might not be right for you. Lastly, your patio will require regular maintenance. Some of you might be thinking; so what? I already have to maintain my garden landscape so a little bit of hardscaping won’t hurt! However, patio maintenance can be quite taxing, and it could even cost extra money if you want to keep it in the best condition possible. You need to worry about things like de-weeding between the pavers, ensuring the materials stay clean and don’t erode, and so on. While it’s not something you’ll do every single day, it is something you definitely can’t avoid. The problem is, quite a few people forget about patio maintenance, which shortens the lifespan of theirs and leads to expensive issues that need repairing. All I’m saying is that you need to be aware that having a patio comes with some extra work attached! Should Your Garden Have A Patio? Here we go, the big question that needs answering; is a garden patio right for you? I said at the start of this piece that reviewing the pros and cons should put you in a better position to make a more confident decision. So, has it? 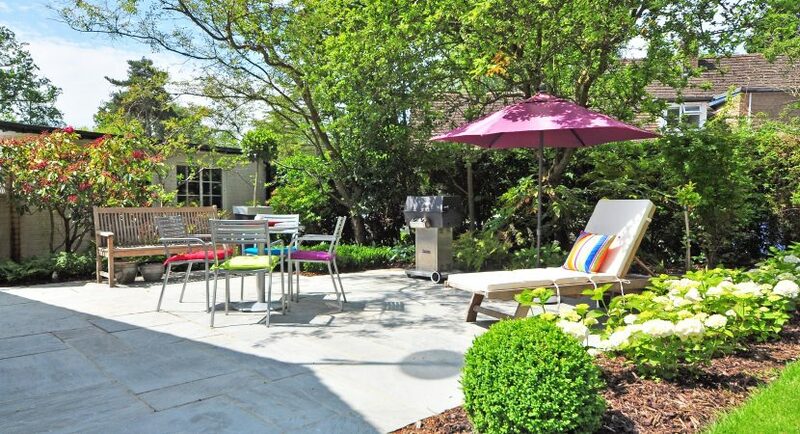 Are you now in a place where you can categorically say yes or no to a patio? Obviously, I can’t make your decision for you, and I absolutely refuse to – just in case I make the wrong one! But, what I can say is that patios are great for some people. If your garden is big enough, or if you don’t care about having a lawn, then patios are very practical for you. Plus, if you’re someone that likes sitting outside and extending their living space into the garden, then there’s no better option than a patio. It can be somewhere to host garden parties, entertain guests, or eat outside with your family. If you have the money spare, then why not? After all, it can make your garden look gorgeous! However, if you don’t have the cash, don’t have a big enough garden, and have no real interest in extending your living space, then is it worth it for you? I’d say it probably isn’t. Weigh up your options, look at the pros and cons, then come to your final decision!